A NASA plan to launch the world's largest solar sail into space and unfurl it like a giant parasol has passed a major test as the mission moves closer to a planned January 2015 launch. Sunjammer mission successfully deployed part of its huge solar sail in a test on Sept. 30, revealing the craft should be ready to function successfully following its January 2015 launch. 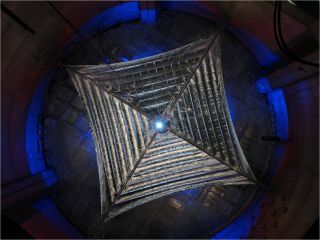 The giant Sunjammer solar sail, cleared a successful design test that required the deploying beam to stretch a quarter of the sail completely open. Because the Sept. 30 test took place on Earth, gravity and atmosphere made conditions more challenging than they would be in the vacuum of space, the sail's designers said. Technicians at L'Garde, the primary contractor for the Sunjammer mission, work carefully with the enormous solar sail. "If this test succeeded under these stressing conditions, we certainly anticipate it will work exceedingly well in space," Nathan Barnes, President of lead contractor L'Garde Inc, said in a statement. When Sunjammer launches in 2015, it will be the largest solar sail ever flown. Covering an area of almost 13,000 square feet (1,200 square meters), the full sail will span approximately a third the length of a football field. Despite its size, the enormous sail will be only about five millionths of a meter thick, keeping its weight down to 70 pounds (31 kilograms). The lightweight, reflective material will rely on the pressure generated by sunlight to maneuver it through space. Smaller sails at the end of each of four booms will act as rudders to help the craft navigate. The fully deployed solar sail spans approximately a third the length of a football field. Sunjammer will monitor solar activity as it demonstrates the validity of relying solely on low-cost, propellantless solar winds for spacecraft navigation. Ultimately, Sunjammer could form a part of a fleet of solar sail crafts providing an early warning system for space weather. Other sun-powered craft could travel completely out of the solar system. The successful deployment of Sunjammer's solar sail is a key step for the success of the mission. "We are very pleased by these results, as they bring us one step closer to realizing NASA's vision of a propellantless spacecraft and introduce the exciting potential of solar sails to the world," L'Garde's Space Services CEO Charles Chafer said in the same statement.